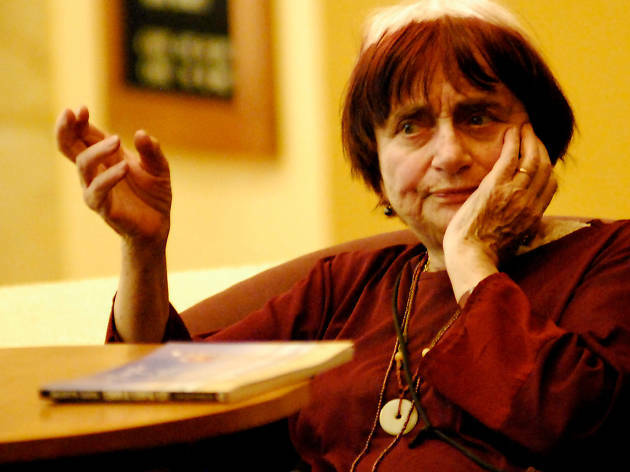 French New Wave legend Agnès Varda recently attended a career-spanning retrospective of her work at the University of Chicago. The Logan Center Gallery in Hyde Park is also currently hosting an exhibit of her work, “Photographs Get Moving (potatoes and shells, too),” through November 8. 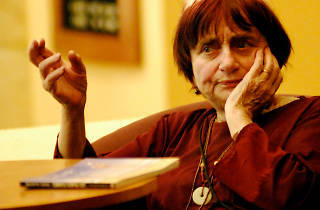 I recently spoke to Varda about the exhibit and her career. The photos of the potatoes in your new exhibit have both a playful and mysterious quality. Some resemble science-fiction landscapes. I also remember the heart-shaped potato you discovered in The Gleaners and I. Where does your fascination come from? As you said, the discovery of heart-shaped potatoes started, by chance, during the shooting of The Gleaners and I. I felt right away all the thoughts related to that modest vegetable with a shape that means affection, love, tenderness. You can’t resist the usual meaning of that word, heart, of its usual shape. I kept those potatoes for a long time in different places—in the dark or in the light, in open air or in boxes. I started to photograph them, to film them. When invited to the Venice Art Biennale, I did my first potato installation, Patatutopia, a triptych that has been exhibited in the Logan Center in Chicago. It’s a homage to the energy of life coming out of old potatoes, uneatable, useless, quite dead. The beauty of germs and new thin roots… It’s not science fiction, it‘s real science. Life resists, energy resists. I showed some photographs, each old potato is different from the others. The exhibit is called "Photographs Get Moving." One senses the movement within these still images just like one senses the individual frames within your movies. What is the relationship between still photography and cinema? What you saw, what you noticed is just what it is. The photographs chosen with me by Dominique Bluher, the curator, contain movement and lead naturally to the moving images, video or cinema. My work, for years, has been using the links between photography and cinema, playing to erase the borders between these two ways of showing reality, reinventing reality. Cleo from 5 to 7 is one of the seminal films of the French New Wave and just played to a packed house in one of Chicago's largest movie theaters. Are you surprised by its enduring popularity? I couldn’t imagine when I wrote and directed Cleo from 5 to 7 that my ideas related to continuous time and real geography during 90 minutes would remain an interesting approach to cinema, and that the fear of Cleo facing a possible death would remain touching to future generations. How strange and wonderful 54 years later to communicate so directly with audiences of many countries. For a long time you've exclusively made documentary films, which are wonderful for the intense curiosity they show in your subjects. My favorite is Vagabond, which has a documentary influence but also an incomparable performance by Sandrine Bonnaire. Do you ever miss working with actors? Would you ever be interested in making another fiction feature? Yes, even in a total fiction like Vagabond I looked for a documentary texture. The non-actors (the real people) had their way to speak the words I had written for them (but inspired by their ways of speaking, their natural behavior). As for Sandrine Bonnaire, a very young actress, she was over-gifted. About making another feature: I sometimes miss the help of the talented actors I worked with such as Michel Piccoli, Jane Birkin, Jean-Pierre Léaud, Catherine Deneuve—I’m impressed by them. I’m shy. I work more easily on documentaries since I like people. I like to make connections with all kinds of people, especially the outsiders. Jean-Luc Godard has an amusing cameo in Cleo from 5 to 7. Since you and he are the only directors from that era still working today, I was wondering what you thought of his recent work. Jean-Luc Godard and Anna Karina were very good friends of Jacques Demy and I in the '60s. He came to perform with Anna in a little sketch in which he accepted to take his dark glasses off for a few minutes. That’s the peak of the sketch. Jean-Luc is an experimental director and he’s certainly the one who has most invented the language of cinema in different aspects. The way he recently used the 3D in Adieu au Langage showed how different he is from the other directors. I’m glad he persistently films his thoughts about cinema and art. You spoke very movingly about Chantal Akerman being an "uncompromising" filmmaker. I met Chantal in 1997 and she seemed pessimistic about her ability to get films financed in the future due to what she perceived as the increasingly commercial nature of the medium. Do you feel optimistic about the future of cinema? More specifically, the possibility that daring, new filmmakers will be able to create works as radical and monumental as Jeanne Dielman? Chantal Akerman’s films remain important for all the film-lovers. You know what I said about her work. The difficulties she met to get her projects off the ground are the same for all the unconventional or daring writer-directors and more and more since the mainstream films are most of the time just the same as ever. For more information about "Agnès Varda: Photographs Get Moving (potatoes and shells, too)" visit the Logan Center Gallery's website.